What is Information Architecture, or IA, and why is it important? Who does it? Who should? If these questions have been buzzing around in your head, getting in the way of daily thought, this article is just the thing for you. On the other hand, if you’re only interested in creating a user-friendly, converting, professional, etc. site, read on, oh grasshopper. Imagine your website as an enclosed system of information. You have your business, and you want to build your website as a personal business hub. For example, let’s say you sell tools. You have tools for home repair, car repair, boat repair; you know your website is the perfect place for any DIY fanatic. How are you going to lay out the information on your website? What are you going to do to keep visitors there? What are you going to do to bring them back? Now, information architecture is more than just usability, but usability is part of it. You need to figure out the best way to lay out your site to make it more usable for visitors, easier for search engines to crawl and in a way that makes sense. Will you have a “home” link to the home page? If your visitor is on a page, will the link to the page still work or will it become a “non-link”? Will you have a contact link or just a phone number? Before creating your top navigation structure, you’ll need to answer these questions. Often called “dropdowns”, there’s always a question whether second tier navigation is a good or bad thing. If you can create a nice, clean top navigation without making dropdowns, more power to you. However, if you have way too much information to share, some form of secondary menu is necessary. After all, a main navigation with 30 links just wouldn’t be reasonable, would it? While this information layout is pretty basic and not researched or extremely thought out, it should give you some ideas of how to structure your layout. The main categories (1st left hand column) might be part of your main menu. The next column your second tier. Anything after the second column, however, you may have several links. In this case, it may be best to create a secondary menu on the side, or a page for each menu section. Think hard about it. Try to develop a mockup of any way you can think of to lay this information out; it’s much easier to judge a visual representation than try to see it in your head. 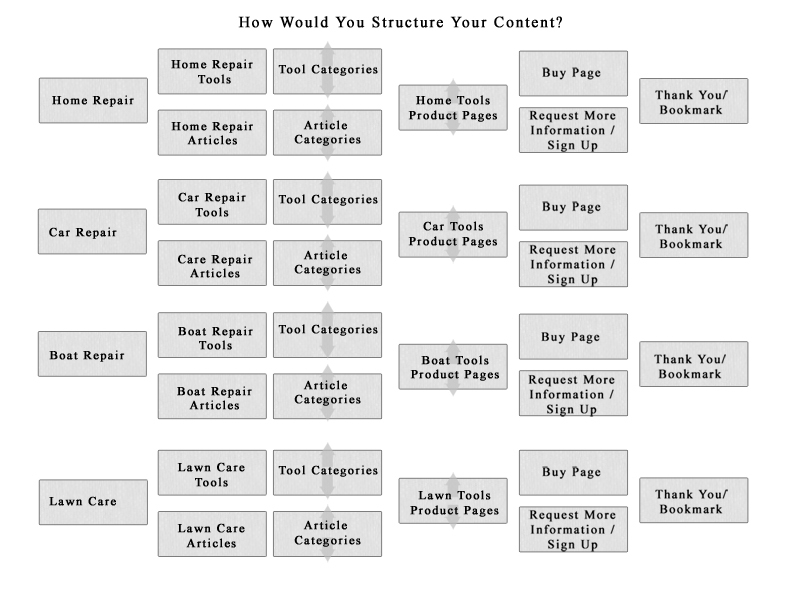 The architecture of your site content shouldn’t be taken lightly. Not only can this help search engines provide more relevant results when you show up in the SERPs, but it can also make it much easier for users to understand and navigate the site. Remember, there’s no such thing as “intuitive navigation” – not really. However, the closer you can come to it, the more often your traffic will come back to gain information, look for products – and convert.